I am always on the lookout for a different way to cook chicken. My kids love chicken and I can always find a decent deal on chicken at the grocery store when I watch for good sales. I found this recipe and knew immediately that I had to try it out! The brown sugar and garlic added a nice flavor to the chicken breast meat. I was really impressed at how the sweet and savory flavor of the brown sugar and garlic really infused into the meat making each bite tender, juicy and packed with a lot of flavor. The kids really enjoyed this recipe too and it is one I will be making again and again I am sure! 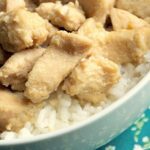 I added a side of steamed rice and spooned some of the leftover liquid from the crock-pot over the rice and it was delicious! You can also easily make this into a freezer meal by doing a bit of prep work ahead of time and adding everything to a freezer bag! 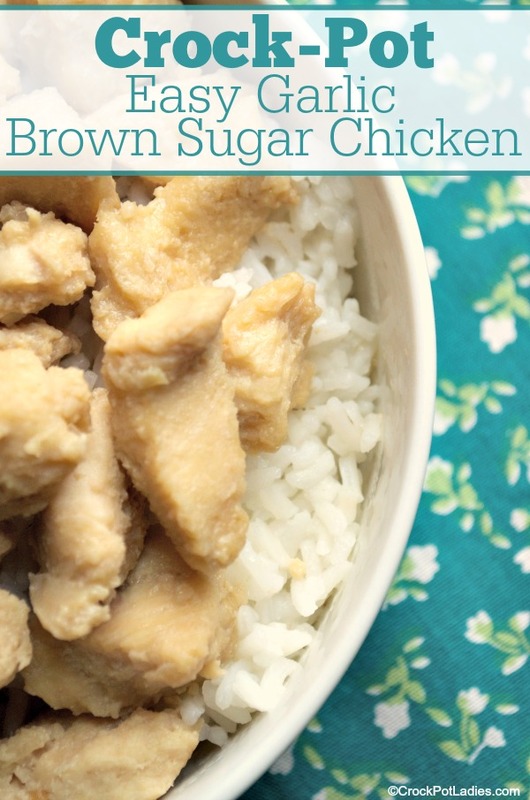 Everyone will love this easy 4 ingredient slow cooker recipe. 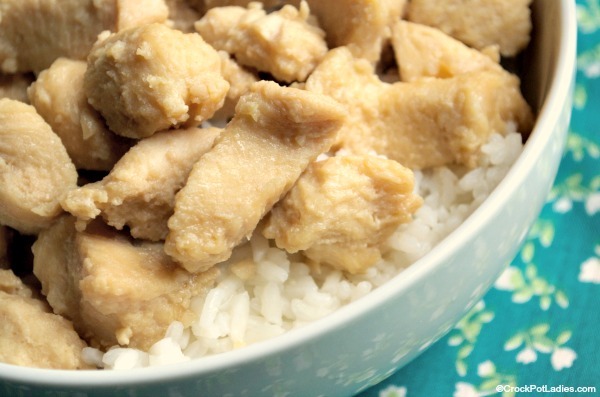 Serve the cooked chicken over rice with a side of veggies for a simple meal full of great flavor! In a large skillet heat the olive oil and minced garlic and cook for a minute or two, just until the garlic starts to turn translucent but not browned. Add in brown sugar and heat until brown sugar has melted. Add chicken to a bowl and pour garlic and brown sugar mixture over it. Add the chicken to a 5 - 6 quart crock-pot and cook on LOW for 2 to 4 hours. Serve over hot cooked white or brown rice. Freezer meal instructions: Follow instructions 1 through 3 above. Place everything in a gallon sized zippered freezer bag and squish out as much air as possible before zipping closed. Label your bag with name of dish and cooking instructions. To to cook freezer meal: Place frozen meal in refrigerator overnight to partially thaw ingredients OR place frozen bag in a sink of cold water to thaw just enough to be able to easily dump contents of bag into your slow cooker. Cook on LOW for 4 to 5 hours from a partially frozen state. This recipe was alright. I followed the directions exactly. The brown sugar never dissolved, instead began to caramelize. I quickly removed and added to the chicken. The chicken did come out moist. The flavor was sweet and savory but kind of bland. Missing something. This one was a no go at my house. Like Kristen said this recipe was meh. Followed the directions exactly but like she said the brown sugar never dissolved, but started to caramelize. I to quickly removed it and added it to the chicken but mine immediately got hard. The chicken did come out moist but flavor was not the greatest, it was slightly sweet and pretty much bland. This one was a no go at my house too. Will NOT make this again. I will try this, but will add salt and pepper. I think that will help the flavor that these reviewers said was missing.